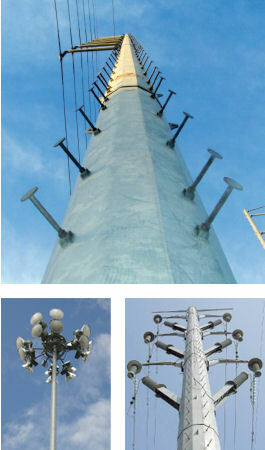 From 69 kV up to 400 kV, we design and manufacture a wide array of pole types and configurations. We produce many varieties of poles including single circuit, double circuit, H-frames and overhead-to-underground transitions, all with or without underbuilt circuit supports. We routinely provide reliable solutions for complex base plate specifications, special crossarm requirements and multiple accessory configurations. Over the years we have developed a well earned reputation in the challenging telecommunication and high-mast lighting pole sectors, supplying poles in varying heights for diverse wind conditions and equipment requirements. We utilize the latest versions of PLS-CADD, PLS-POLE, CAISSON, bocad, AutoCAD and other CAD software. Finite element analysis of special connections, cross arms and base plates provides a complete structural analysis that identifies possible stress concentrations in critical areas.